In this last week of December, if it hasn’t become obvious by Monday’s and yesterday’s posts, respectively, I have taken it upon myself to squeeze in a last few posts before we turn the calendar to 2011. It generally is not usual for me to blog every weekday (a reason why I don’t think I’d be ready to do something like NaBloPoMo or whatever it is just yet). I will still have lots of leftovers – as of now, 298 drafts (and growing); we’ll see how that goes over the next couple years – but these ones that I’m pushing are more or less the ones I want out of the way for the New Year. That all said, now you’re probably wondering about my choice for today. Don’t be fooled by this shortbread’s appearance: while it may not look the showiest model to ever walk down the culinary catwalk, it will surprise you, if it didn’t already as it was baking, as one of the best shortbreads you’ll have ever tasted – and you’ll be coming back for more. Think of all those times of finding that extraordinary something or that extraordinary somebody underneath a humble exterior. I’ve made lots of things that aren’t exactly pretty and yet taste fantastic but I haven’t shared them here strictly because of appearances. Will someone really believe that that could be the tastiest thing they’ve had in their life? This is something I’ve been learning and coming to terms with as I blog along – and I’m sure that many other bloggers before me have learned or are still learning: that just because it isn’t pretty, it doesn’t always mean that it isn’t blog worthy. They came about after I was asked to make the lemon bars again and, being out of lemon juice, my Mum suggested vanilla extract and almond extract. I was skeptical but I ran with it. I used butter the first time but Earth Balance (I use the soy-free version) also works equally well. Since using the stuff, I love Earth Balance and I love using it, for whatever I’m doing. 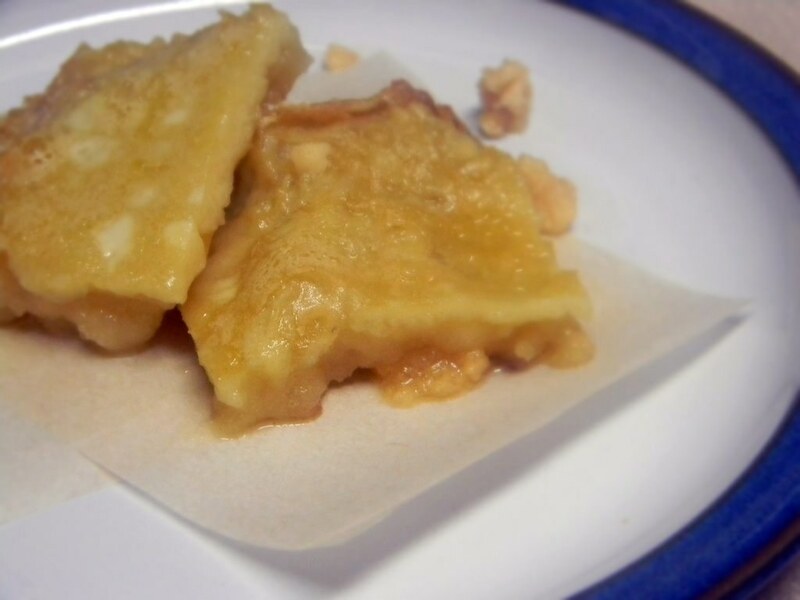 It’s appearance is of the same nature as the lemon bars: the filling sinks a little into the shortbread, and it’s also a bit wet due to the amount of Earth Balance – or butter – so it’s best eaten with a spoon. It doesn’t matter, though, after you taste it. From the first moment I tasted it I knew I’d hit on something good. Everyone loved them. It’s one of those things I wouldn’t feel guilty to eat the whole thing, if I could – or at least half of it – standing over the counter, without sharing. Seriously. (More diligent self-discipline concurs that one square is completely satisfactory while more than one is indulgent.) I don’t think I’ve had something so buttery or so flavourful in ages that I’ve liked immediately in that way. My brother loves mixing, so for the video he simply mixed the ingredients while I added them and you get to see almost the whole process. Though shot back when these were originally made, it’s my first video in two months! Goodness, I didn’t know it had been that long. It’s also my longest video to date – clocking in at about ten minutes, so I apologize for the length since my videos are usually within the five-minute range. Note to mobile readers: there are YouTube annotations in this video for instructions. You may not be able to see them depending on your mobile device. If you do make this with butter, note that the appearance of the shortbread after its initial bake is slightly different from the shortbread made with Earth Balance. The butter-based shortbread acquires a surface with indents and tiny holes (not airholes), and it’s really soft and crumbly. The Earth Balance-based shortbread maintains a smooth-top surface, again very soft – so soft you’ll leave a dent if you touch it with your finger. (Not recommended, by the way – burned myself a few times doing such a foolhardy thing. How long have I been in the kitchen again?) The grease from the butter also goes through the parchment paper, so you’ll still have to clean the pan afterward. I once used half a cup of the sweet rice flour when I was out of both white and brown rice flour without any difference in texture of flavour. If, however, you have either on hand, use a quarter of a cup of brown or white rice flour and a quarter of a cup of the sweet rice flour. *Ideally it should be the same consistency as the Earth Balance spread, which is solid but soft enough to spread. Not extremely soft like it’s been sitting out on the counter all day. Preheat oven to 350ºF and line an 8″ by 8″ or 9″ by 9″ square pan with parchment paper. Shortbread: Mix the Earth Balance or butter with the flours, gums, and salt (if using). Keep mixing as it forms balls to eventually changing into a pliable dough. If you mix longer, it will transition to a more thick, batter-like consistency. Either is fine. Gently mix in the honey. Scape the dough/batter into the prepared pan with a spatula (preferably flexible) and spread out evenly. Bake for 20 minutes. Assembly: Remove the shortbread from the oven, leaving the oven on. Let cool slightly, from about 5 to 10 minutes. Pour the filling over the shortbread and put back in the oven, baking an additional 20 minutes or until the filling is set. Remove from oven, turn off the heat, and cool sufficiently before cutting and serving. Enjoy! Hi Shirley, absolutely! 😉 They also happen to be another Dad favourite. I’ll need to make them again soon. These look amazing! I don’t care if they’re not perfect looking. 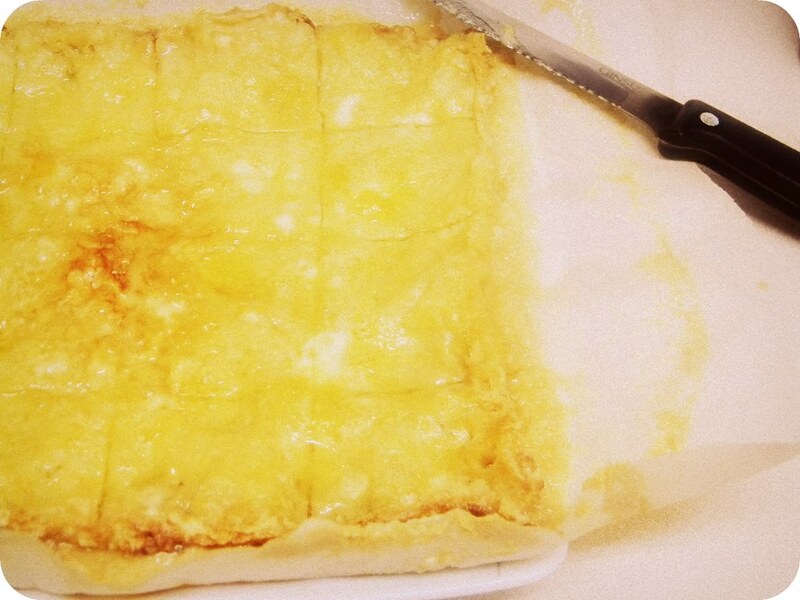 They actually remind me of how my lemon squares used to look. People would never choose them at the dessert table, but once someone ate one and told everyone how good they were, they were gone instantly! I laughed when I read your comment because this always happens at our Church bake sales! One brave soul tastes one and then like wildfire it spreads. Now people look for them first to buy and they don’t last long! Iris – thank you! If you read the recipe, you’ll notice these bars are simply a variation of those lemon squares.